It was so high tech, and such a team of specialists in the control room, theatre and recovery ward, that the final token of the morning’s procedure was a surprise. ‘Nurse, it may need a band-aid.’ A band-aid! Next morning, I stood in the shower, wondering at the minimalist punctuation on my groin: a band-aid, from a cupboard in Recovery. Congratulations to them all. And to the Furphy family for continuing to support the annual prize, awarded by the Fellowship of Australian Writers, WA branch. 3 Until you get to Page 50. Then calm down, and start worrying about the quality. Do feel anxiety – it's the job. 5 Do restrict your browsing to a few websites a day. Don't go near the online bookies – unless it's research. 6 Do keep a thesaurus, but in the shed at the back of the garden or behind the fridge, somewhere that demands travel or effort. Chances are the words that come into your head will do fine, eg "horse", "ran", "said". 7 Do, occasionally, give in to temptation. Wash the kitchen floor, hang out the washing. It's research. 9 Do not search amazon.co.uk for the book you haven't written yet. 10 Do spend a few minutes a day working on the cover biog – "He divides his time between Kabul and Tierra del Fuego." But then get back to work. SAWA-Australia, the Support Association for the Women of Afghanistan, is dedicated to raising funds for human rights, education, nutrition, health, safety, and improving the self-esteem of Afghanistan's women and children, including those who live as refugees in Pakistan. In honour of International Women’s Day and to promote the work of SAWA, poems by famous and unknown Afghan women will be read by Chilla Bulbeck and Sarah Leighton of SAWA. * Nadia Anjuman, who had been gaining a name for herself as a poet in Afghan literary circles, before she died, aged 25, in 2005 in Herat after being beaten by her husband. A literature undergraduate at Herat University, she published her first volume of poems shortly prior to her death, titled Gule Dudi (Dark Flower). · Contributors to the Afghan Women's Writing Project (AWWP) http://awwproject.wordpress.com/ (). The project was set up by US novelist Masha Hamilton as a way for Afghan women to share their experiences with the rest of the world. 36 women from across Afghanistan publish their work anonymously, their own families often not aware of what they are doing. If found, these women could face serious reprisals. One writer says she has ‘received a death threat from Taliban’. · Granaz Moussavi’s work, including ‘Afghan Woman’ will also be in the program. Granaz Moussavi has been invited to read her poetry in France, the USA, London and Goteborg. Her collections include پا برهنه تا صبح (Barefoot Till Morning) and وازهای زن بی‌اجازه (Songs Of Forbidden Woman). She recently directed the movie "My Tehran for Sale" (which SAWA hopes to bring to Perth for a showing mid-year). 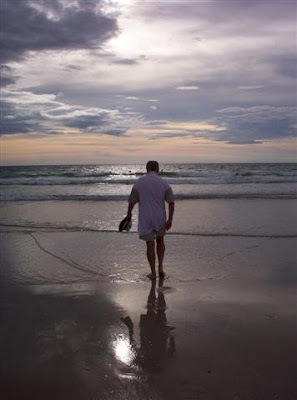 · Ros and Steve Barnes write and perform songs about people and places in our everyday lives. Steve is an award-winning songwriter and Ros interprets his songs with clarity and strength. It's not complicated or tricksy- just one voice, one fine guitar, good words and the whole thing comes together Ros and Steve Barnes write and perform songs about people and places in our everyday lives. Steve is an award-winning songwriter and Ros interprets his songs with clarity and strength. It's not complicated or tricksy- just one voice, one fine guitar, good words and the whole thing comes together. In 1943, the American poet, Ezra Pound, was indicted by the United States government on the charge of treason. It was alleged that Pound, an American citizen, had made anti-American broadcasts over Italian radio during wartime, and that these same broadcasts had given "aid and comfort" to the enemy. By war's end Pound found himself in the custody of U.S. marshals. Mindful of the political hysteria of the times, and fearing for Pound's life, his wife, friends and colleagues, urged him to enter a plea of insanity as a means of escaping trial and the possibility of a death penalty. This he did, and the court subsequently upheld the plea. However, instead of releasing him into the care of his wife as had been expected, the government chose to confine him at St Elizabeth’s Hospital in Washington, D.C., an institution that housed hundreds of the criminally insane. Pound - "one of the great literary figures of our time" - would remain incarcerated at St Elizabeth’s for nearly thirteen years. Sixteen Words for Water takes up Pound's life in the final days of his "imprisonment", when the balance between life and death had reached its most critical point. 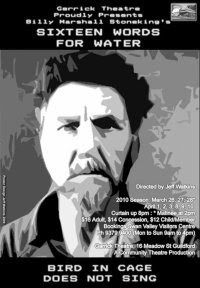 The Ezra Pound of the present play must choose between sanity and the possibility of the electric chair, or insanity and the surety of safety at the expense of freedom. In the midst of this, he finds himself invaded by strange thoughts - memories of the ancient Aboriginal myth of the Wandjina... the creative spirits of the Dreamtime who fashioned the world out of words and who, in the act of naming, threatened the world with chaos. MORE POETS NEEDED FOR THE FIRST HEAT!! Perth - Get Ready to Slam! hip-hop, monologues - or whatever. Contestants can register at the www.perthpoetryslam.com website. Audience tickets are $5. The venue has limited capacity. 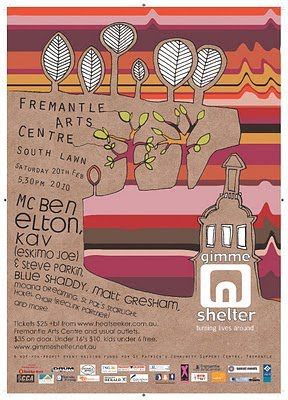 See: http://www.perthpoetryslam.com for all the details, and to register. I'm proud to say five poems of mine are now on display at http://frankshome.org Please take a look, then check out the other poets there. A living anthology which accepts many different styles. It's my great privilege to be included. A wonderful, ultimately joyous, insight into the creative life of one of our best loved poets. 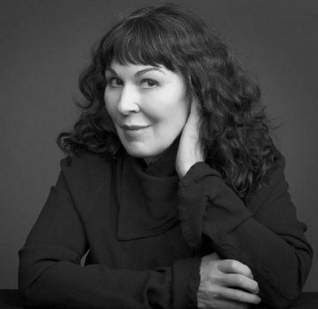 In On Passion celebrated Australian poet Dorothy Porter delves headfirst into the passions, both literary and earthly. We discover the young Dorothy Porter's 'drug of choice' was none other than romantic love and that 'some of the most deeply passionate experiences of [her] life happened between the covers of a book'. Written just before she passed away in 2008, On Passion is a wonderful, ultimately joyous, insight into the creative life of one of our best loved poets. Once upon a time, the mad women of the Swan River Settlement looked at this venue to give them shelter, too! Poetry is aversion of conformity in pursuit of new forms, or can be. By form I mean ways of putting things together, or stripping them apart, I mean ways of accounting for what weighs upon any one of us, or that poetry tosses up into an imaginary air like so many swans flying out of a magician’s depthless black hat so that suddenly, like when the sky all at once turns white or purple or day-glo blue, we breathe more deeply. By form I mean how any one of us interprets what’s swirling so often incomprehensibly about us, or the stutter with which he stutter, the warbling tone in which she sing off and on key. If form averts conformity, then it swings wide of this culture’s insatiable desire for, yet hatred of, assimilation — a manic-depressive cycle of go along, go away that is a crucial catalyst in the stiflingly effective process of cultural self-regulation and self-censorship. 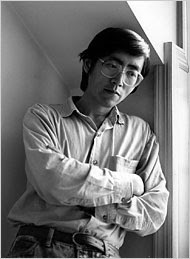 It is particularly amusing that those who protest loudest about the fraudulence or aridness or sameness of contemporary poetry that insists on being contemporary, dissident, different, and who profess, in contrast, the primacy of the individual voice, fanned by a gentile inspiration, produce work largely indistinguishable from dozens of their peers and, moreover, tend to recognize the value only of poetry that fits into the narrow horizon of their particular style and subject matter. As if poetry were a craft that there is a right way or wrong way to do: in which case, I prefer the wrong way — anything better than the well-wrought epiphany of predictable measure — for at least the cracks and flaws show signs of life. At the same Argotist online site, there are a few Tranter sonnets. A different way to promote your work. Ewa Lipska: [Poetry] arises from solitude. Lipska’s rejection of nationalism is consistent with her vision of the artist's role in society. She would argue that the poet does not craft a work out of sheer will or calculation; rather, art depends on an innocence rooted in a fidelity to personal experience, an authentic response to one's life that is lost in politics, or any other highly organized, artificial social system. The solidarity of poets, unlike that of political regimes, or of activists organized against them, is not a matter of design. Poetry is not collective life. It arises from solitude; it cannot be planned. Lipska thinks of art not only as a rejection of political intention but also as a deliberate engagement with the irrational and with uselessness." I'd like to live Elsewhere. who are not born into the world. At last we would be happily alone. No stop would wait for us. No wars would fight for us. No humanity. No army. No weapon. Tipsy death. 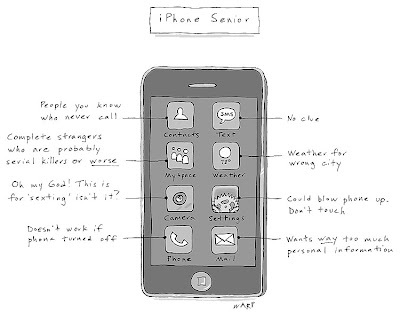 It would be fun. In the library, multivolume time. It would turn the pages of our hearts in a whisper. I like you a twenty-year-old poet writes to me. A beginning carpenter of words. His letter smells of lumber. His muse still sleeps in rosewood. Ambitious noise in a literary sawmill. Apprentices veneering a gullible tongue. They cut to size the shy plywood of sentences. A haiku whittled with a plane. with a splinter lodged in memory. Wood shavings fly. The apple cores of angels. Dust up to the heavens. A great active visual poem. Take a look! You might call it a white ceiling meditation. ‘Will I scrub now?’ a Japanese face at the door. surgeon’s cap on, a wrap-around apron. More white ceiling meditation, Om. splashing drunkenly like Pollack in a mood. by a small needle pain in my right groin. testing angles on my chest area. it took a close up of the cave within. room, having grown there for 65 years. and bent its neck to peer up-close at my left ribs. in a stage whisper from amateur variety. blockages and … ‘ She spoke on. at the minimalist punctuation on my groin. A band-aid, from a cupboard in Recovery. I am over ruling rules these days. Left the hospital on my own two feet. halfway home to tell me that. What a rebel. and park in the manager's bay. 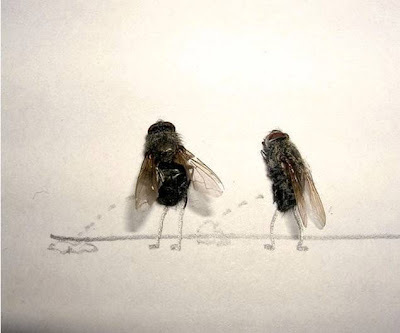 Some wit made great folk art/cartoons out of dead flies. I present one here. If I think of it,I'll present more tomorrow. Stand by. 1. It's the dog’s mess that I find hard to swallow. 16. The man next door has a large erection in the back garden, which is highly unsightly and dangerous. 20. I have had the clerk of works down on the first floor six times but I still have no satisfaction. 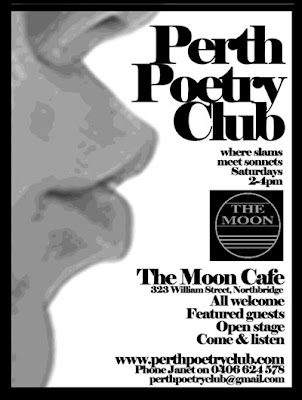 Plus OPEN MIKE for poets and songwriters, professional sound, and the friendly ambience of The Moon cafe. 2-4pm, 323 William Street, Northbridge. Come and listen! The ABC has put all the Bush Slam poems online so you can read them at your leisure. These poems were written under unusual pressures and distractions, so I wonder how the poets feel about them being on public display. It must have been part of their contract. Bush Slam: three days, two poets, one town… Finding the heartbeat of the nation in verse. 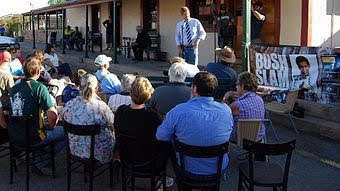 Bush Slam puts poets and poetry in motion across Australia to discover the true spirit of the country. Our host H.G. Nelson (Greig Pickhaver) is at the wheel of the Bush Slam bus, each week taking two very different poets to explore a rural community and meet its people. Each is given just three days to capture the heart of the town in verse – and then the tricky bit, to perform their work before the locals in a live head-to-head poetry slam for a thumbs-up or a thumbs-down! Bush Slam features Australia’s leading poets and songwriters, including John Kinsella, Geoff Goodfellow, Sam Wagan Watson, Emily Ballou, Joel Ma, Melinda Schneider, Alison Croggon and James Blundell. "We're Bam Creative, an award winning website design and development company, based in Perth, Western Australia. " To go with the Amanda Curtin interview below. As I said when I posted this link to facebook, it's too easy: just press a button and you know what I am interested in today or any day. I love interviews with friends because I always find out more about them than I ever knew. I may know how many sugars they have in their hot beverage but I often don't know what prompted them to write in the first place. Very interesting interview here, especially if you have read The Sinkings. When you have a few minutes, read this. It's worth it. I advertise this in part as protest at the $99.90 price tag on concert tickets for the Branford Marsalis Quartet in March. What extortion! Friday night you will hear absolutely world-class contemporary jazz in a more intimate setting for a small percentage of that concert price! Support Live Jazz - particulalry SUPPORT LIVE AUSTRALIAN JAZZ. 8.00pm Jamie Oehlers' Blowfish with special guest Allira Wilson. Blowfish is a group that Jamie Oehlers led in Melbourne for nearly 10 years, regularly playing at festivals around Australia and at Bennett’s Lane in Melbourne with guest vocalists and also performing tributes to Charles Mingus, Duke Ellington and Art Blakey and the Jazz Messengers. This is a dynamic and energetic eight piece group that packs a lot of punch! 11.30pm Late night groove series featuring Tara Del Borrello. Tara is a fast rising star on the Perth scene. She has just completed her degree in Music at WAAPA and is making a much anticipated return appearance after singing with The Roast, The Chemist and also her own Late night groove show on NYE. She was a finalist in the 2004 Australian Idol and continues to forge a reputation as a fine singer. He stood with barrels round him -- at a loss.